Interaction with horses is recognised globally as a powerful and experiential tool that quickly breaks down barriers and changes behavioural patterns. It’s a fun, interactive and highly-effective way to work on specific issues, experiences or challenges. 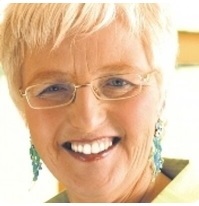 Eileen Bennett tells how horses connect people to their true value and full potential in a unique and powerful way. Including one or more horses as part of a treatment team may seem very 21st century, but the concept has been around for a very long time. In the 5th century BC, Hippocrates, the ‘father of medicine’ spoke of the horse as a healer, and throughout history we find many references to the physical and emotional benefits of having horses in your life. Therapeutic horse-riding has been around since the mid-19th century and is now widely accepted as a valuable means of providing a range of physical and other advantages. For example, a walking horse transfers 110 multidimensional swinging movements to the rider every minute, which naturally increases core strength, body control and balance. However, the ways in which horses can enhance our lives is not limited to sitting on their backs. Equine-assisted Learning (EAL) is a ground-based method of utilising horses as a catalyst for positive change. It is a powerful and fun way to nurture life skills, and develop social and emotional core competencies. 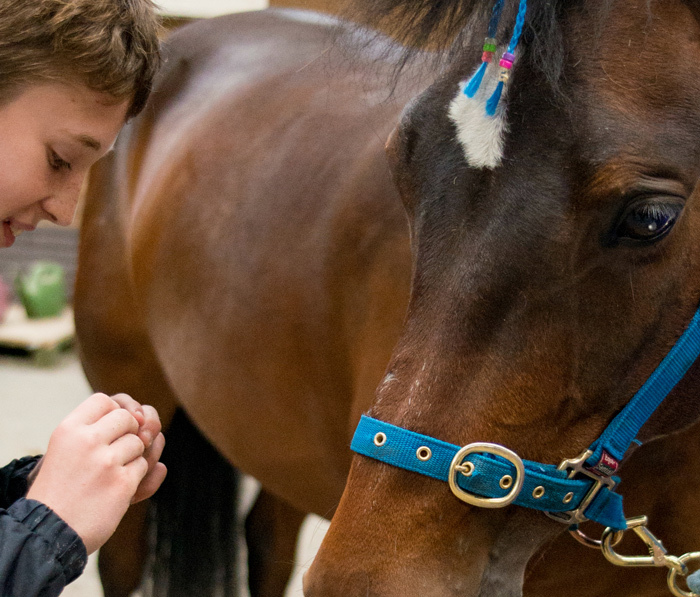 The aim is to promote self-awareness and development through specific interactions, activities and games with horses, under the guidance of a trained Equine-Assisted Learning facilitator. For the EAGALA model of Equine-Assisted Learning, the treatment team always includes a Mental Health Professional, an Equine Specialist and one or more horses. EAGALA (Equine Assisted Growth and Learning Association) is a non-profit professional organisation with over 4,500 members in 50 countries. EAGALA sets the standard of professional excellence in how horses and people work together to improve the quality of life and mental health of individuals, families and groups worldwide. Horses are particularly suited to EAL work because they are prey animals; hard-wired for millennia to tune in to anything that could pose a threat. Their very survival depended on knowing whether that predator in the bushes was sleeping or eyeing them up for lunch. Because of this, horses live only in the present moment. What happened 5 minutes ago or what might happen tomorrow is never in their consciousness. So, when you are with a horse, the horse is not seeing a person with a disability, or a child with a problem. The horse is just seeing – and reacting to – a person. Horses are mostly non-verbal. They communicate with each other by means of a highly sophisticated language of subtle body movements. The flick of an ear or the swish of a tail is sending a message to the rest of the herd. Most of us are unaware of the messages we are sending out through our bodies, but the horses are reading them loud and clear! Horses reveal their thoughts and feelings with their body language and behaviour. They do not ask, demand, or expect anything from us. They simply want to feel safe, comfortable, and to get along. EAL sessions can be run for individuals or groups. A typical individual session lasts an hour, and a group session is 90 minutes. Sessions are always tailored to the needs of the participants, so no two will ever be the same. 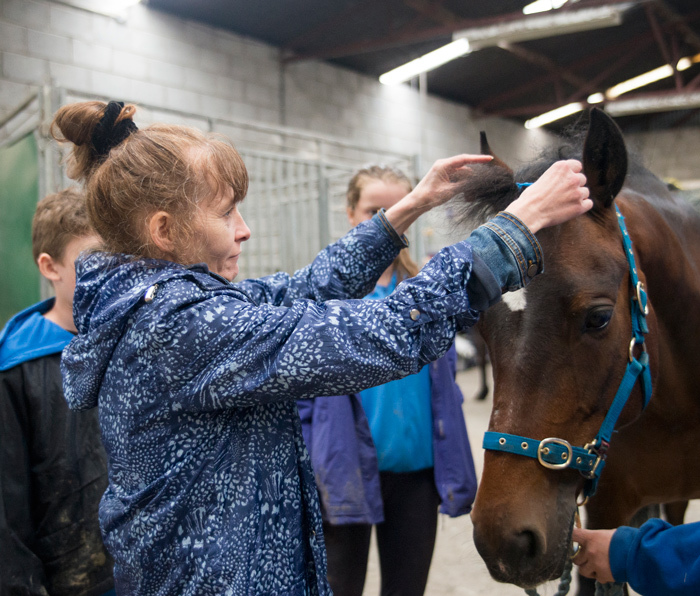 The very nature of a horse means that EAL work is a perfect fit for improving the social and emotional core competencies of Self-awareness, Self-Management, Social Awareness, Relationships skills and Responsible decision-making. The horses respond to each individual in the present moment, just as they are. 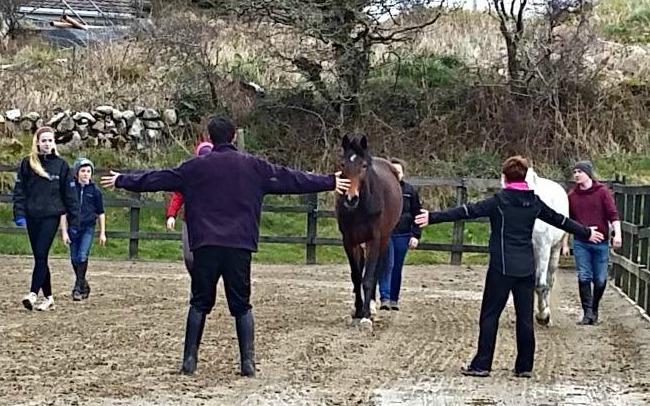 Equine-Assisted Learning (EAL) is a unique way of enabling people to learn a wide range of skills through interaction with horses on the ground. It works on many levels and can be adapted to meet the needs of an individual or group. When a person can understand and be understood by a large animal, communication with people becomes easier and more rewarding, and the horse becomes a tool for emotional growth and learning. In collaboration with other professionals (e.g. Physiotherapist, O.T. or S.L.T) EAL sessions can also be adapted to help with Literacy and Numeracy, social or verbal skills, Executive Functioning and much more. Interacting with horses is a rewarding experience that can help develop a sense of responsibility, feelings of love and nurturing, and better coping strategies. Eileen Bennett is co-founder and CEO of Horses Connect Enterprises, a social firm based in Galway designing and deliver equine-assisted programs. As well as an experienced horse-person and coach, she is also qualified as a Therapeutic Horse-riding Coach, Equine-assisted Learning Facilitator and an EAGALA certified Equine Specialist. She holds qualifications in Mindfulness, Leadership and e-Business and helps run the Horses Connect Special Olympics Equestrian Club.